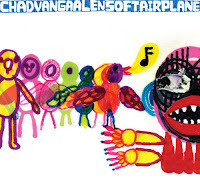 Sixeyes: Chad VanGaalen: "Soft Airplane"
The first album in ages to literally make me feel good. A song like"Willow Tree" (the lead off track) makes me smile and cry (okay, sniffle a bit) at the same time, but you may wonder how a song that provokes tears can inspire feeling of happiness, as well? It's simply the fact that rarely does music magically alter my brain chemistry so extremely... and so well. Calgary's VanGaalen can sing in Neil Young's quaver, but without the fragility which Young naturally inhabits, VanGaalen's voice is stronger and more varied, matching his many creative interests. In the lovely, and perhaps haunted, track "Cries of The Dead", VanGaalen builds a lyric out of what I imagine is the many hours he has spent in his basement studio hearing his neighbours, like ghosts, in his headphones. A stellar song from an astonishing album titled Soft Airplane, one which I predict will win the next year's Polaris Prize. The youtube video above is one of three promo videos which Chad did entirely on his own, you know, just for fun. BUY Chad VanGaalen's music... fellow Canadians go here to buy online. Download his first two critically acclaimed records at eMusic. Look into eMusic's FREE trial here. This is absolutely one of my new obsessions. Great music.